This is a great platform for learning more about BLE and the ARM Cortex-M4 architecture. It seems as if every company I've worked with in the past 6 months is using the Nordic nRF5x. The nRF52 is an "ultra-low power" SoC consisting of a Cortex-M4F MCU with an integrated 2.4GHz transceiver. Nordic also supplies software stacks supporting various BLE configurations as well as other useful features like DFU & OTA updates. The nRF52 is an upgrade over the nRF51 line and provides higher TX power, and the ability to use more flash and RAM in your system. The nRF52 line is Bluetooth 5 ready, though the nRF52 DK does not support the new long-range LE Coded PHY. However, the 2M PHY and other Bluetooth 5 features are supported. Nordic chips are directly usable as the primary SoC in low-powered BLE devices. However, I also note a trend of using nRF5x SoCs as a secondary processor in complex systems. Since Nordic provides a fully functional BLE stack, a paired Nordic SoC can be used to handle BLE comms, freeing up the main system processor for other tasks. Other systems take advantage of the low power and use it as an always-on processor that monitors various inputs and wakes the primary system when required. To support devopment on the nRF52 line, Nordic provides the nRF52 DK. 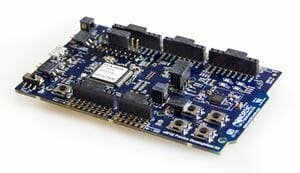 This development kit is based on the nRF52832 SoC and is also recommended if you wish to utilize the nRF52810 SoC in your system. The nRF52 DK is compatible with Arduino shields, providing for interesting prototyping options right out of the box. The kit also comes with an NFC antenna so you can test the NFC tag and out-of-band NFC pairing functionality. The nRF52 DK is compatible with ARM mbed.